We are aso in the process of constructing an area for tourers which we hope will be in use for 2004. This area wil have a shower block and electrical hook up points. They all have 2 bedrooms and are fully fitted with TV, fridge, gas fire, shower, microwave, kettle, toaster and have all the facilities you would expect in a modern self catering accommodation. Bedroom 1: Double bed with 2 bedside tables, 2 lamps, 2 double wardrobe with a mirrored dressing table inset. Shower room: Shower cubicle, flush tpilet, wash hand basin, electric shaver point and light all within a fully tiled room. Bedroom 2: 2 single beds with draws below. Kitchen area: Draw unit, 2 base units, stainless steel sink, fridge, gas cooker and grill, 2 wall units and shelves. Lounge : Fire place with TV above, 2 two seater settees, laminate floor through lounge and kitchen area. French doors leading to a verandah with patio set. All bedding is provided, the price of the cabins includes gas, electricity, fishing and VAT, these are based on four sharing. At the southern end, it also has a wooden bridge linking it to a Lake of 1.3 acres called The Neck. This has 16 marked fishing pegs and at the southern end in front of the Holiday Cabins there are a further 6 double pegs exclusively for the Cabin residents. 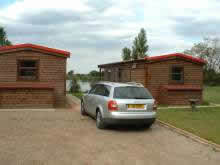 The cabins all have a lockable tackle store (7’3″x3’6″) situated at the rear with a security light above.